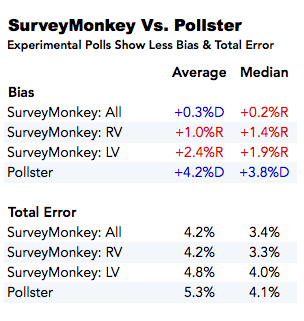 SurveyMonkey shares previously unreleased 2014 polls that outperformed Pollster's averages. Another poll shows bipartisan support for President Obama's immigration policy, if not his executive action. And the latest investigation changed few minds on Benghazi. This is HuffPollster for Thursday, December 4, 2014. 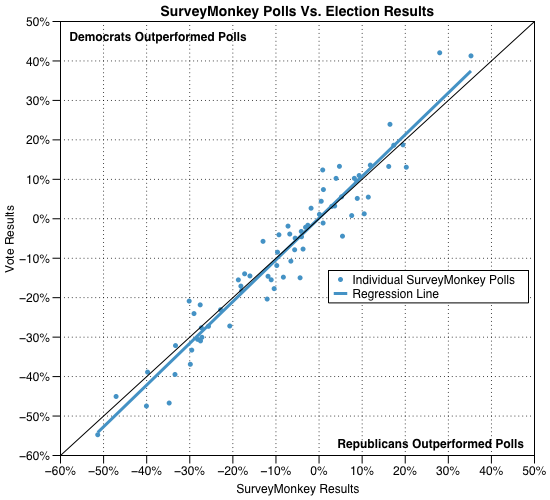 SURVEYMONKEY'S 2014 ELECTION POLLS - A set of previously unreleased polls from SurveyMonkey shared exclusively with HuffPollster helps demonstrate the potential for their internet-based survey methodology. A few days before the election, SurveyMonkey shared with HuffPollster a spreadsheet that included horse race results from surveys they conducted over the last two weeks before the election in 45 states, covering every contested race for Senate and governor in 2014. Since the project was both experimental and relatively cursory in its modeling of the likely electorate, HuffPollster agreed to wait to publish the results until after the election. That said, we can verify that the analysis that follows derives from data shared with us in final form on the morning of November 4, before votes were counted. Some background on the methodology: While telephone polls typically involve true random samples of working telephone numbers, the Internet allows no way to randomly select a sample of all email addresses or those who go online. Instead, most Internet research companies, including HuffPost's polling partner YouGov, recruit large "panels" of respondents, usually via web advertising, who agree to participate in online surveys. Since the panels are not representative of larger populations, Internet researchers strive to reduce bias and make their data representative through the use of weighting, sample matching and other efforts to "model" a representative sample. 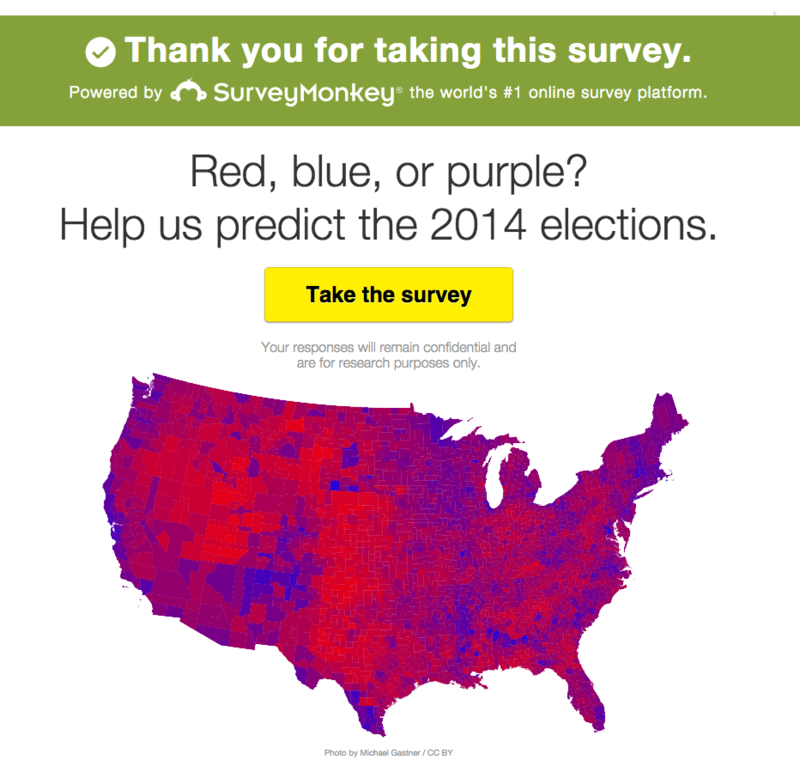 For this project, SurveyMonkey took a somewhat different approach. They did not draw participants from a pre-recruited panel. Instead, they solicited respondents from the millions of people that complete SurveyMonkey's "do it yourself" surveys every day run by their customers for companies, schools and community organizations. At the very end of these customer surveys, they asked respondents if they could answer additional questions to "help us predict the 2014 elections." That process yielded over 130,000 completed interviews across the 45 states with contested races for Senate or governor. SurveyMonkey tabulated the results for all adult respondents in each state after weighting to match Census estimates for gender, age, education and race for adults -- a relatively simple approach analogous to the way most pollsters weight random sample telephone polls. SurveyMonkey provided HuffPollster with results for each contest tabulated among all respondents as well as among subgroups of self-identified registered voters and among "likely voters -- those who said they had either already voted or were absolutely certain or very likely to vote (full results are published here). “We sliced the data by these traditional cuts so we could easily compare them with other surveys," explains Jon Cohen, SurveyMonkey's vice president of survey research, "but there’s growing evidence that we shouldn’t necessarily use voters’ own assessments of whether or not they'll vote." In future elections, Cohen adds, they plan "to dig in and build more sophisticated models that leverage the particular attributes of the data we collect." (In a blog post published separately on Thursday, Cohen adds more detail about how the surveys were conducted). The results are relatively straightforward. The full SurveyMonkey samples did very well in forecasting winners, showing the ultimate victor ahead in all 36 Senate races and missing in just three contests for Governor (Connecticut, Florida and Maryland). The more impressive finding is the way the SurveyMonkey samples outperformed the estimates produced by HuffPost Pollster's poll tracking model. Our models, which are essentially averages of public polls, were based on all available surveys and calibrated to corresponded to results from the non-partisan polls that had performed well in previous elections. 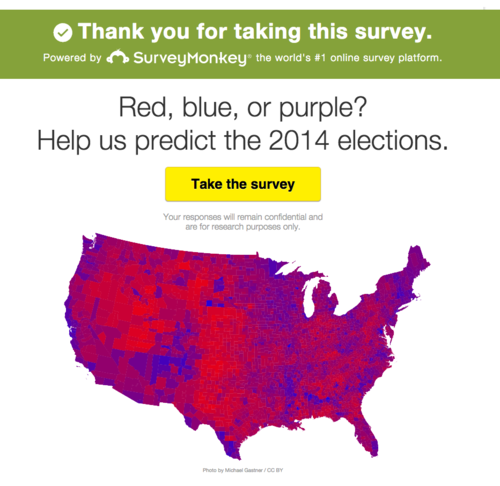 SurveyMonkey's full samples in each state showed virtually no bias, on average. By comparison, the Pollster models overstated the Democrats' margins against Republican candidates by an average 4 percent. And while SurveyMonkey's margins were off in individual contests, the spread of those errors was slightly smaller than the spread of those for the Pollster averages (as indicated by the total error, the average of the absolute values of the error on the Democrat vs Republican margins). Not surprisingly, the cuts that narrowed their full samples to self-reported registered and likely voters made the SurveyMonkey results more Republican and introduced some overstatement of Republican performance. Nonetheless, the average error for their results among these subgroups were still smaller than Pollster tracking models for both bias and total error. Given the solicitation used -- an explicit pitch to help predict the elections -- it's likely that their initial participants were already "likely voters." Interest in the survey topic has been shown to influence response, and validation studies find that voters are more likely than non-voters to participate in telephone surveys. It is possible that the voters in this particular election, with an apparently lower turnout of key Democratic constituencies, closely matched a Republican leaning pool of respondents that completed SurveyMonkey customer surveys. "If you’re a polling firm who always shows Rs ahead," as election forecaster Drew Linzer put it on Twitter in the context of automated phone polls, "an election where lots of Rs win doesn't validate your methods." But that said, these results suggest that SurveyMonkey's pool of respondents is diverse (or "heterogeneous") enough that only relatively simple modeling was necessary, at least in this case, to remove their bias as compared to a true random sample of voters. While SurveyMonkey plans on "more sophisticated models" in the future, this characteristic means their efforts may not need to be quite as heroic as those applied to other data sources with more inherent bias.